Miriam was delighted to hear this. I was not interested in pursuing this conversation with Miriam who is, if the truth be told, an incredibly depraved young Jewess without a moral compass. 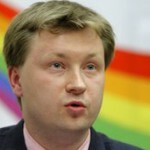 Here is Nikolay Alexeyev who has been campaigning for years for the right to stage gay pride parades in Russia. In order to spite dear old Nikolay and his kind, Moscow’s top court has upheld a ban on gay pride marches in the Russian capital for the next 100 years! Russia’s best-known gay rights campaigner, Nikolay had previously gone to court hoping to overturn the city council’s ban on gay parades. The silly boy had actually demanded the right to stage such parades in Moscow for the next 100 years, somehow implying that he didn’t mind what happened when the hundred years was up. This illogicality on his part obviously didn’t go down very well with the mayor and aldermen of Moscow, not to mention the good burghers of the city — assuming they have mayors, aldermen and burghers in Moscow. I know they have burgers, but I’m not sure about burghers. I’ll have to check! Nickolay also opposes St Petersburg’s ban on spreading “homosexual propaganda”. The European Court of Human Rights has told Russia to pay him damages. This is because the European Court of Human Rights believes that spreading propaganda is a “human right”, especially if it’s war propaganda or homosexual propaganda. If it is propaganda for traditional moral values and ethical decency, they are understandably not so keen on its dissemination. I mean, let’s face it, who wants to be decent nowadays? I’ve never heard anything so outrageous. At this rate, they will be threatening to bring back capital punshment, torture, and the Ten Commandments. Actually, they have brought back torture. So it’s geting pretty scary. It could be the Ten Commandments next. On Friday Nickolay said he would go back to the European Court in Strasbourg to push for a recognition that Moscow’s ban on gay pride marches — past, present and future — was unconstutional. Well, that’s interesting, because almost everything done in the United States nowadays is “unconstitutional”, including targeted assassinations, imprisonment without due process, and torture for fun. I think this is a shocking attitude to take. It implies there’s something wrong with public disorder. Which is ridiculous. It implies that the democratic will of the people of Moscow, who are strangely enough called “Muscovites” instead of “Moscovites”, ought to be taken into account. Which is even more ridiculous. Americans will not sympathize with these views since they know it’s now an American tradition never to implement the will of the people. If the people want something, the American government strongly believes, every attempt should be made to give them the opposite. If they want peace, for example, it’s best to give them war. If they want a fairer distribution of wealth, it’s best to rob the poor to make the rich richer. If they want job security, it’s best to export their jobs to the Third World. In short, if they want to be happy, it’s best to make them thoroughly miserable. This is how government now works in America. It’s called neo-democracy. Not very different from tyranny, in point of fact, but please don’t tell the sheeple that! When riots in the streets break out and half the American population find themseves behind bars — apart, that is, for the children of Abraham who will fulfil the role of prison warders — the sheeple will be told that locking them up is the new freedom. And the sillybillies will believe it! In September, the Council of Europe — the main human rights watchdog in Europe — will examine Russia’s response to a previous European Court ruling on the gay rights issue, Russian media report. In October 2010 the court said Russia had discriminated against Mr Alexeyev on grounds of sexual orientation. It had considered Moscow’s ban on gay parades covering the period 2006-2008, obviousy under the bizarre impression that they had a perfect right to stick their long noses into Russia’s private affairs. That Russia is a sovereign country, in which Russians decide what is best for themselves, is a principle that has apparently not penetrated the thick skulls of these European politicians — the same politicians, incidentally, who blinked and turned their eyes the other way when pedophilia was running rampant in Belgium during the time of the Dutroux child murders. It is deeply disturbing to think that loving couples like those on the left will no longer be able to show their mutual affection in public for the next hundred years in Moscow’s Gay Pride Parades. They will be forced to confine their amorous activities to the private sphere. Is this right or fair? I don’t think so! Russia is clearly showing signs of degeneracy. This is not how civilized countries ought to behave. I vote we bomb Iran, where they are just as bad, And then take out Russia. And maybe China too. All these anti-democratric countries, where the will of ordinary people is taken into account, are obviously a threat to civilization and democratic values. These horrible countries also have a lot of oil and gas, though of course this is totally irrelevant. So why did I mention it? Hmmm, I guess it’s because I’m not very bright — in fact, I’m virtually a moron. Pandora Pushkin is a writer of satirical spoofs. She is looking for her soulmate, preferably a wig maker, but refuses to provide an email address. This is a pity, because she is quite an attractive young lady.